Dudelange (French pronunciation: ​[dydlɑ̃ʒ]; Luxembourgish: Diddeleng pronounced [ˈdidəleŋ], German: Düdelingen) is a commune with town status in southern Luxembourg. It is the fourth-most populous commune, with 19,734 inhabitants. Dudelange is situated close to the border with France. 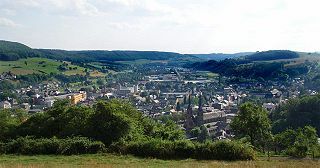 As of 2015[update], the town of Dudelange, which lies in the centre of the commune, has a population of 19,734, making it Luxembourg's third-most populous town. The commune also includes the smaller town of Budersberg, to the north-west. The Mont Saint-Jean, close to Budersberg, hosts the ruins of a medieval castle. Dudelange is an important industrial town that grew out of the three villages and a steel mill in 1900. The D in the name of the ARBED steel company, later merged into ArcelorMittal, stood for Dudelange. As well as the Dudelange Radio Tower, an FM radio and television transmitter, it is also the site of the Centre national de l’audiovisuel (CNA), a cultural institute founded in 1989 under the aegis of the Ministry of Culture in order to preserve, promote and exhibit Luxembourg's audiovisual and photographic heritage. The centre hosts a two-screen cinema, a restaurant and a library focused on the visual arts. Dudelange is home to the Luxembourg's most successful football club in recent times. F91 Dudelange won nine national titles between 2000 and 2011. Alex Bodry (born 1958) a politician from Luxembourg. Etienne Schneider (born 1971) a Luxembourg politician and economist, Deputy Prime Minister and Minister of the Economy. ^ "Dominique Lang (1874-1919)" Archived 2010-09-29 at the Wayback Machine, Centre de Documentation sur les Migrations Humaines. (in French) Retrieved 22 January 2011. Wikivoyage has a travel guide for Dudelange. Echternach is a commune with town status in the canton of Echternach, which is part of the district of Grevenmacher, in eastern Luxembourg. Echternach lies near the border with Germany, and is the oldest town in Luxembourg. Differdange is a commune with town status in south-western Luxembourg, 17 miles (27 km) west from the country's capital. It lies near the borders with Belgium and France and it is located in the canton of Esch-sur-Alzette. With a population of around 26,000, Differdange is the country's third largest city. It is also the main town of the commune, and other towns within the commune include Lasauvage, Niederkorn, and Oberkorn. Rumelange is a commune with town status in south-western Luxembourg, on the border with France. Grevenmacher is a commune with town status in eastern Luxembourg, near the border with Germany. It gives its name to and is the capital of the canton of Grevenmacher, and, until its abolition in 2015, the district of Grevenmacher. The town is situated on the left bank of the Moselle River, in a wine growing region. Luxembourg competed at the 1952 Summer Olympics in Helsinki, Finland. 44 competitors, all men, took part in 32 events in 9 sports. Émile Hamilius was a Luxembourgish politician for the Democratic Party. He was the Mayor of Luxembourg City from 1946 until 1963, and also sat three stints in the Chamber of Deputies. Hamilius was the second President of the Council of European Municipalities and Regions, from 1953 until 1959. Luxembourg sent a delegation to compete at the 2014 Winter Olympics in Sochi, Russia from 7–23 February 2014. This was Luxembourg's eighth appearance at a Winter Olympic Games. The Luxembourgian team consisted of one athlete in cross-country skiing, Kari Peters. In the only event he contested, the men's sprint, he finished in 79th place. He withdrew from the 15 km classical due to illness. Luxembourg competed at the 2016 Summer Olympics in Rio de Janeiro, Brazil, from 5 to 21 August 2016. Since the nation's official debut in 1900, Luxembourgish athletes have appeared in every edition of the Summer Olympic Games throughout the modern era, with the exception of the sparsely attended 1904 and 1908 Summer Olympics, and the 1932 Summer Olympics in Los Angeles at the period of the worldwide Great Depression.